SOFIA, Bulgaria (BulgarianMilitary.com) – The Bulgarian Deputy Minister of Defence Lieutenant General Atanas Zapryanov participated in the European Defence Agency’s annual conference, held yesterday (29th November) at Brussels, which this year was devoted to unmanned and autonomous systems as a critical topic on the agendas of the national and European decision makers, learned BulgarianMilitary.com. 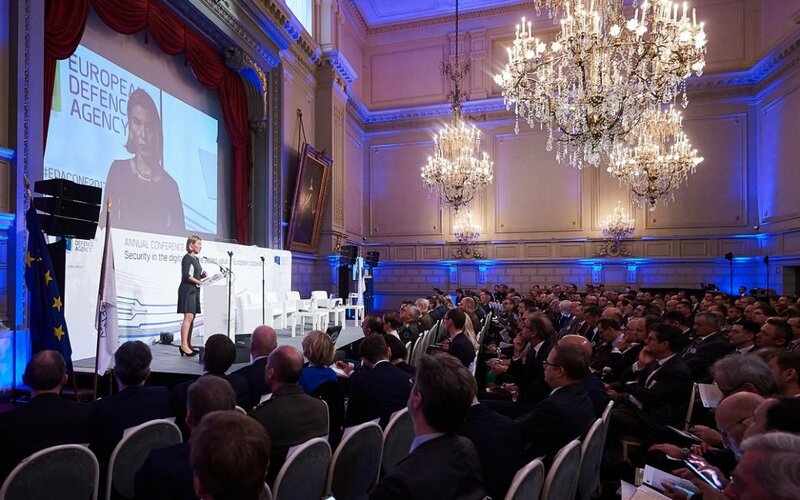 The EDA’s annual conference entitled ‘From Unmanned to Autonomous Systems: Trends, Challenges and Opportunities’ was opened yesterday morning by the Head of the European Defence Agency, the High Representative of the EU for Foreign Affairs and Security Policy Federica Mogherini. Among the official guests and the keynote speakers were Dr Wolfgang Baumann, Secretary-General of the Austrian Ministry of Defence on behalf of the Austrian Presidency of the Council of the European Union, General Claudio Graziano, Chairman-designate of the European Union Military Committee as well as the European Commissioner for Digital Economy and Society Mariya Gabriel. Bulgarian Deputy Minister of Defence was among the high-level panelists participating in the debate included in the first discussion panel of the conference, which was moderated by NATO Deputy Assistant Secretary-General for Public Diplomacy Carmen Romero. His interlocutors in the debate “How today’s Armed Forces are adapting to tomorrow’s technologies, with a special focus on unmanned and autonomous systems”, were the Director of the Security Programme at the Hague Centre for Strategic Studies Frank Bekkers, the Director of Technical Innovation and Secretariat General of the Defence and National Armaments Directorate at the Ministry of Defence of Italy Dr Luisa Riccardi and the State Secretary for Procurement at the Ministry of Defence of Germany Benedikt Zimmer. Atanas Zapryanov highlighted the tendency of the countries to seek to develop and acquire revolutionary technologies in order to achieve military superiority, pointing unmanned and autonomous systems as part of these innovations. The higher level of autonomy in weapons systems, inevitably, raises a number of humanitarian, moral and ethical issues, which presupposes the desire every stage of the use of such systems to remain under human control. After stating this, Atanas Zapryanov analyzed the consequences on the doctrines, structures, command and control and training of the armed forces. The European Commissioner for Digital Economy and Society Mariya Gabriel, spoke about the future Digital Europe Program (DEP), in which the EU member states will focus on investing in cybersecurity technologies. EU investments in this field have already begun with the implementation of the Preparatory Action on Defence Research, and will be further developed under the EU Defence Industrial Development Programme and the future European Defense Fund (EDF).